The newly updated 37-page Valley County Master Plan has been incorporated into the Valley County Comprehensive Plan, a document that guides the future planning and development of the county. Our latest Master Plan was approved by the Valley County Commission in July 2017. The previous Master Plan was adopted by Valley County government in 2005. The current Master Plan also is strengthened by the latest pathway plans developed by the Cities of McCall, Donnelly and Cascade, and it also embraces the North Fork Payette River online Water Trails recreation guide. A new 2-inch binder contains all of the plans in living color, including all the maps. 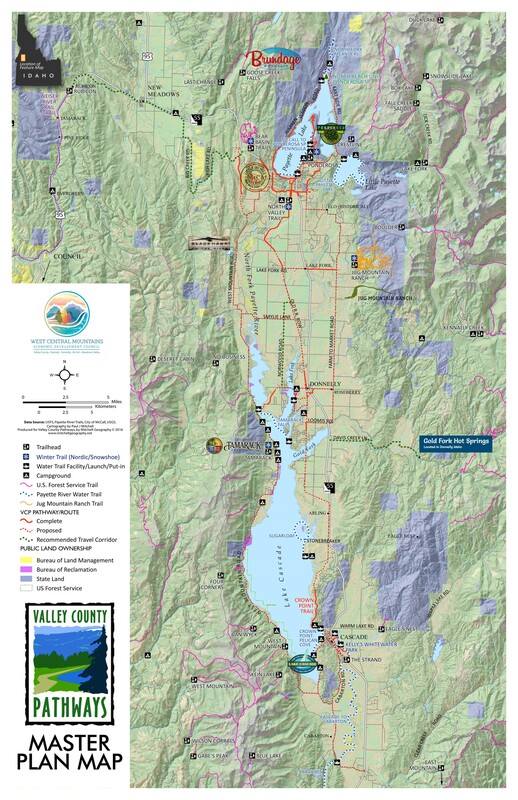 A north-south pathway system in Long Valley would seek to connect the communities of McCall, Donnelly, Lake Fork and Cascade, complete a pathway around Payette Lake, and establish a pathway corridor around Lake Cascade. To the maximum extent possible, the Valley County Pathway System would connect valley trails to community and neighborhood pathway networks, tourism amenities and services, parks, schools, natural areas, and national forest roads and trails. In our update, the vision now includes linking to Adams County, New Meadows and the Weiser River Trail. Work on property easements or donations of property along the old Railroad ROW from Lake Fork to Pine Lakes Ranch. In particular, VCP is focusing on working with property owners along the RR ROW between Lake Fork and the city of Donnelly, starting from the south and north ends and moving toward the middle. In the interim, develop “Share the Road” or “Bike Route” on Norwood Lane from Lake Fork Road to West Roseberry Road in Donnelly, providing a public road corridor for bicyclists, walkers and trail-runners, tying together the communities of Lake Fork and Donnelly. Develop public road corridor connecting Valley County to Adams County and the Weiser River Trail. We have identified the Fish Lake Road and Big Creek Road as the public roads connecting a public corridor between the two counties. These corridors should be signed with “Share the Road” or “Bike Route” signage to show people the way to connect to Adams County and the Weiser River Trail. Work on developing a detached pathway or bike lanes from Roseberry Road to Roseberry (aligns with City of Donnelly priority) and on Farm to Market Road from Roseberry to Elo Road, Krahn Lane and Sampson Trail to link Farm to Market to McCall (aligns with city of McCall priority). Work on developing a detached pathway on West Mountain Road from Blackhawk to Tamarack Falls. Work on developing a detached pathway on West Deinhard Lane to the junction with the existing McCall bike path near Mission Street. Continue working on pathway corridor around Payette Lake. New, wider bike lanes will be built on Warren Wagon Road on the west side of the lake in 2018. In the meantime, we recommend applying for grant funds to commission a study of building a detached pathway around the east side of Payette Lake. A study will help understand the different land ownerships and costs involved. Work toward more detached bike paths along Lick Creek Road from Shady Lane to East Side Drive. This initiative connects to the goal of building a pathway around Payette Lake. Work toward building bike lanes or a detached pathway along Davis Road to Gold Fork Hot Springs, a popular destination. Work with the Bureau of Reclamation and the Idaho Department of Parks and Recreation to develop pathway corridors around Lake Cascade. A system of priorities should be developed for these potential pathway segments to determine which ones should be focused on in the near term vs. long term. Develop detached pathways between the city of Donnelly and Tamarack Falls on West Roseberry Road. The City of Donnelly is working on developing a detached pathway on the south side of West Roseberry Road to Dawn Drive and the city beach as a high-priority. Develop a detached pathway along Cabarton Road from the Clear Creek junction to the city of Cascade.